Blizzard taking a page from Wrath of the Lich King? I say good show Blizzard, and to quote Tychus Findlay, "Hell, it's about time!" That's great but how about something that lets our other characters learn Cloud Serpent Riding. Ha ha Chrom laughs at your four winds! Same Model As the previous, now-unavailable, flight book: Foliant des Kaltwetterfluges, which was used in the Wrath of the Lich King expansion. I tend to notice that certain parts of the game are completely non-existent ever since flying. You see, there is really no reason to play 60% of this game with over-prominent flying! So basically you raid, do bgs and there is no reason to risk your life for any sort of gain! PVP: World pvp is screwed badly since people shyly sit in the air... you want to be on a pvp server for a reason right? Well come on where is that risk factor? Why else did you choose to be on a pvp server... it's because you want the risk of be attacked AND the ability to defend! It's all in good fun... otherwise please do take kindly to a pve server? I mean to disrespect, but please understand that pvp servers are worthless when it is almost impossible to have any danger through the pvp mechanism! PVE: Honestly, people have nothing to farm anymore because it is just not worth the time when you can fly to some other place, meaning you won't be given the chance to hunt for something. I think this is a good sign by Blizzard with the "No mounts until the next major patch" because getting items and objects will have some sort of value to make your player better, instead of the "quickly go here and get this easy to grab item" which makes for a pointless game. I mean, shouldn't we have to at the very least have SOME challenge? Oh my god I remember how bad the cataclysm quest experience was, I didn't even feel like I did anything to get those quests done. SUMMARY: Flying is just a nice perk to have after the content is no longer main-stream, I can't wait to fly, but for now it would just take away the challenge. Trust me it may seem stupid now, but can it really hurt? It is just a game and it isn't like you wont fly at the expansions end, they did mention (you would know if you read the right article!) that we will fly eventually. This item is obtainable from WoD BMAH located in Nagrand Ring of Blood arena. The start biding price is set at 10k. As description says it allows lvl 85+ chars to fly in Pandaria which should help with lvling speed. At the current price of 10,000g I find it a tad bit over priced, and a year or so too late. Would be worth it if it wasn't consumable. This appeared on the BMAH on my server today (Black Dragonflight - US). It has a start price of 1k gold. Sold by San Redscale. Despite the tooltip stating it requires level 85, as of 6.0.3 (Nov 19th, 2014) it will actually say you are not high enough level if you try to use it on a character between 85-89. Will update this comment when it's fixed. Update: Fixed on Feb 24th, 2015 with the release of patch 6.1. The auction seems to start at 1000 gold. The item is currently bugged, however. The spell that the book teaches still requires level 90. Can you consume this on your level 100 and then all your alts that are 90 will be able to fly in Pandaria? Or is it one tome per alt? It doesn't seem to say anywhere and nobody has explained how it worked exactly. If one tome works for every alt you have and/or create, I'd say it's definitely worth the gold. If one use per alt..... probably not. still doesnt work, very frustrating. I have 3 of these. only blue response I have ever seen is this tiny note about how the q and a department has to look into it. I seriously don't get why this is so complicated. the only point of this book is to give flying in MOP to characters under lvl 90. It is the exact same thing they did in wrath for alts. I also don't know why blizzard hasn't commented at all on this with a solution or some kind of confirmation on how this is supposed to work. At this rate I am tempted to just request a refund through gms as I have bought 3 of these that do virtually nothing for me. I'll wait a month or two because I want these to work but this is a really poor job on Blizzards end and I am disapointed with them. The Grimoire still does not work as intended however I received word from the GMs via a submitted ticket. The fix action for this particular item is almost ready for Live Servers. They mentioned to keep an eye out on future hotfix patch notes. On a side note: They did not perform a work around for the particular toon so hopefully that means it will be sooner than later. Keep faith people, soon your level 85s shall soar through the skies till eventually they hit 90 and are grounded again for the foreseeable future. : Oof, I'd heard of that before actually - I believe that item is still flagged for level 90 if I remember correctly. : I've heard conflicting reports on whether that's intended or not. Is it just miscoded and should work for level 85s or is it mislabeled and is supposed to only work for 90s? : It might be fixed before then though, so definitely watch the hotfixes when those pop up! Can Confirm this works now. Makes lvling in pandaria a lot more enjoyable and cheaper if you plan to get flying there! Now we know it works, can anybody comment on whether or not it's available from anywhere other than the BMAH? One just appeared today on US-Lothar/Grizzli-Hills and the price very early this morning is at 11,000 gold, yes eleven thousand gold. Bug ? Starting price change ? Bidding war ? I can't tell. What I do know is that I bought one less than a week ago and paid 1157 gold for it. I'll be keeping an eye on this one today and on the next ones down the road. 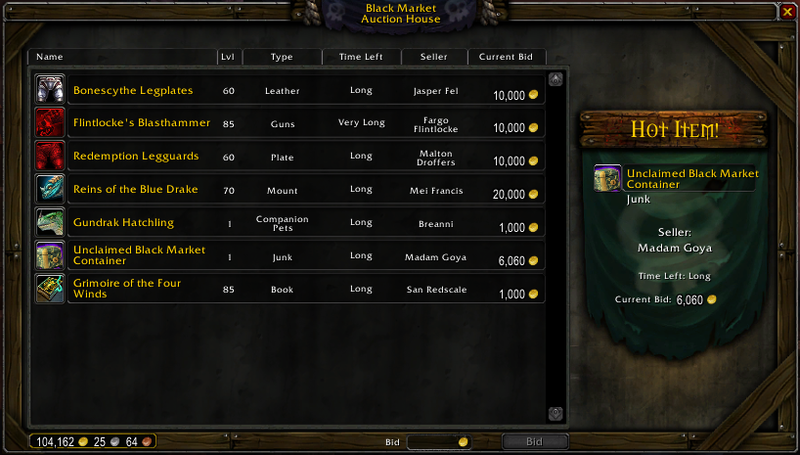 If this a change, leveling alts through Pandaria just got quite a bit more expensive. What is the point of that item? When you need it for faster quest lvling you can't get it, after that, you don't need it unless you are no life farmer farming everything but in this case you can get flying normal way (lvl 90). If at least that was more common item on bmah... Right now it's a joke. For those looking to buy this item well in advance of needing it, expect volatility with the bids from night to night. I won this for 1700G two nights ago. Tonight, it went for over 10k. Now it's not worth to spend 8k more, than from the flying trainer. It's better to spam dungeons as tank or healer, and you are done within few hours. Actually, for the fu*k sake, why we are able to fly in Draenor with every single alt from level 90, while we are forced to move on the ground in Pandaria? Especially with that freaking wall, which is so annoying to pass! Seriously Blizzard, is this so important content to you and the players? Appreciate wowhead a ton - since this isn't account-wide, it is a serious joke. You hit 85 and get to 90 in less than 2 hours, and that's taking your time... and then you never need to fly in MoP again. Add up the time it takes to get this in the first place and wonder if it was really worth it for an item you use for less than 2 hours and in an expansion that is locked and linear anyway - you can't just fly to the dread wastes at 85 and quest... you have to walk the line. Makes you really see "Pathfinder" as genius compared to MoP design. Don't bother buying this grimoire from BMAH. You can now learn flying in Pandaria from the flight trainer @ Shrine of Two Moons for 2500g when you hit level 90. Trainer is right next to the fp master when you fly in on kite. I purchased this item for a boosted alt if I recall because it was cheaper than paying 2500 on each toon. I got mine for like 1200 gold and read it previously on another character. On a toon that just hit 85 I saw wisdom of the four winds pop when I accepted the pandaria lead in quest like I had learned a new spell but once I got to panda land I still couldn't fly. I thought I just needed to do the level 87 quest to talk to the tiger. Even after this and hitting level 88 no flying. The whole situation with the tome and pandaria flight is really confusing so maybe this will prevent people from thinking they can fly prior to level 90 if they do all this because as far as I know you cannot. I believe if you boosted to 90 or higher and have read the book you don't have to do the tiger quest but still I'm not entirely sure. If I go to the flight trainer at the golden terrace at level 88 and select unavailable it shows the spell wisdom of the four winds and the text shows level 90. Perhaps it is a binary thing, get the tome, all your sub 90 toons know the spell but it will not be applied to them until they ding 90? I guess once I hit 90 i'll be able to fly in Pandaria but I won't care because I'm going to Draenor. Currently you level so fast from quests here it's not that much of a big deal but imo if one guy does quests then all alts should get flight in the zone regardless of level. Does anybody know a source for this besides the BMAH? I think I can afford it, but I'm afraid I'll get outbid. And please make it so that ALL my characters will learn Pandaria flying upon use. Removed in Patch 7.3.5 as Weisheit der Vier Winde will no longer exist. I really hope when I log in tomorrow evening these vendor for 1000 or something, I have five or six sitting in storage because I got them cheap and figured I'd use them for alts later but later never came. Edit: So they still exist unchanged after the patch, they're just pointless now. Benutzen: Lehrt Euch die Weisheit der Vier Winde, wodurch Ihr in Pandaria fliegen könnt. Der Foliant wird nach dem Lesen verbraucht.